I can’t believe it’s already the end of the fourth day of our trip. Or is it the fifth day? It’s really hard to keep track, because our families and deadlines are back home, our activity is here, and there’s an eight-hour time difference! So, we’re needing to be reminded of the date and day of the week. Before the trip< I had high hopes of being able to frequently update this blog will all the amazing facts, anecdotes, inspirations, and experiences I’ve taken in each day. But the Internet availability has been spotty (last night I couldn’t get on at all), and sheer exhaustion have curtailed my plans. On top of that, I sustained a nasty sunburn on the back of my neck which has made sleeping a bit uneasy the past couple of nights. But, you know what? It’s all completely worth it! If I can’t tell you about everything as we go along, be assured that I’ll continue sharing with you once I’m back home. There’s way, way too much to try to fit into a few blog posts on the fly! In the past two days, we’ve done more than I can write about tonight. For now I can give you some highlights. 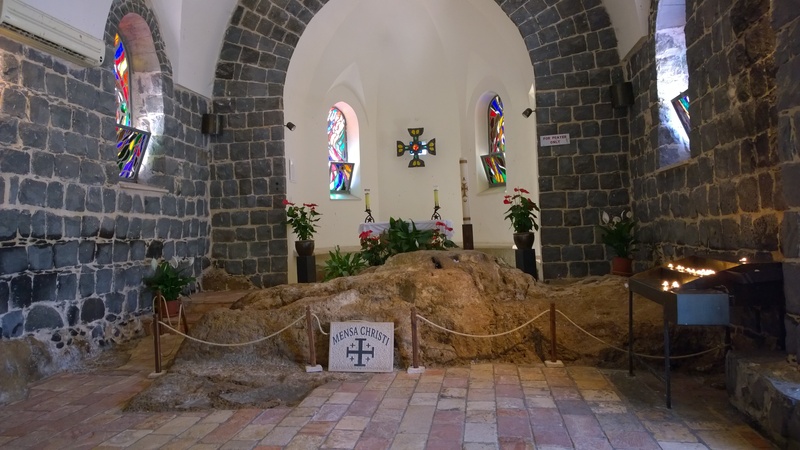 Yesterday, we saw the place and rock upon which Jesus multiplied the loaves and fishes for the 5,000 and also the place where the newly risen Jesus served breakfast to the Apostles. 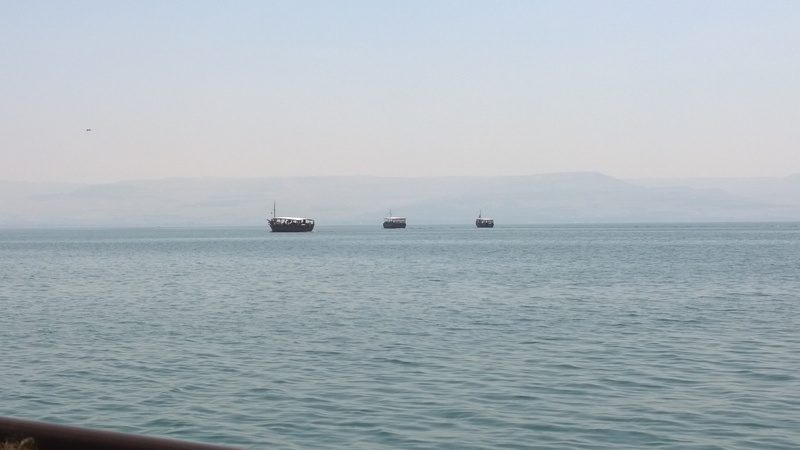 Afterward, we sailed on the Sea of Galilee and saw a 2000+ year old fishing boat that was from the time of Jesus. Then we visited Peter’s house in Capernaum, traveled to Kursi to the place where Jesus dispelled the demons from a man to a pack of swine. Oh yes. In between that we saw The Church of the Twelve Apostles, an exquisite Orthodox Catholic church. I’ll write about all these places in greater detail in upcoming posts. Today, we visited the Jordan River. 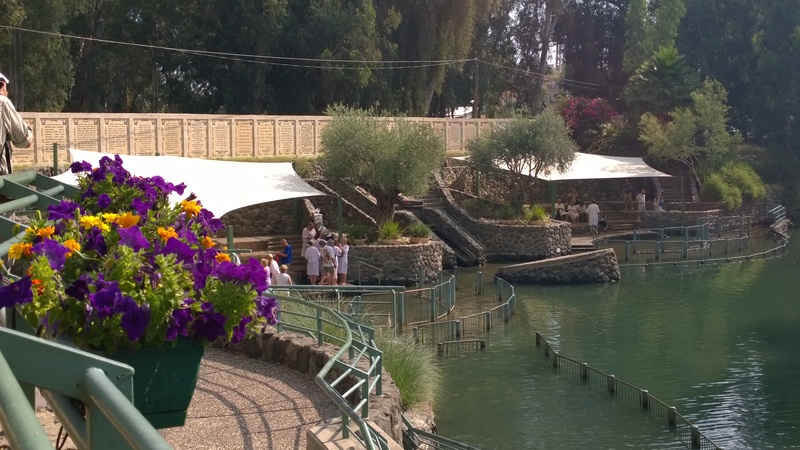 We weren’t able to visit the exact spot Jesus was baptized because the Holy Father was there today, but we got a good idea of what Jesus’s baptism would have been like. We passed Mt. Gilboa where Gideon fought the Medianites and where Saul and his children were hung. We passed Jericho and entered the Dead Sea area. We visited Qumren, where the Dead Sea Scrolls were discovered and then passed En Gedi, where the cave in which David cut off the corner of Saul’s cloak while he was asleep. Finally, we visited Masada which was first the palace and fortress of Herod in 20 B.C. and later the stronghold for Jewish rebels resisting Roman occupation. All of this was absolutely astounding. But, if I had to choose only one thing to expand upon (and I do or I won’t get enough sleep tomorrow), I’d choose sailing on the Sea of Galilee. 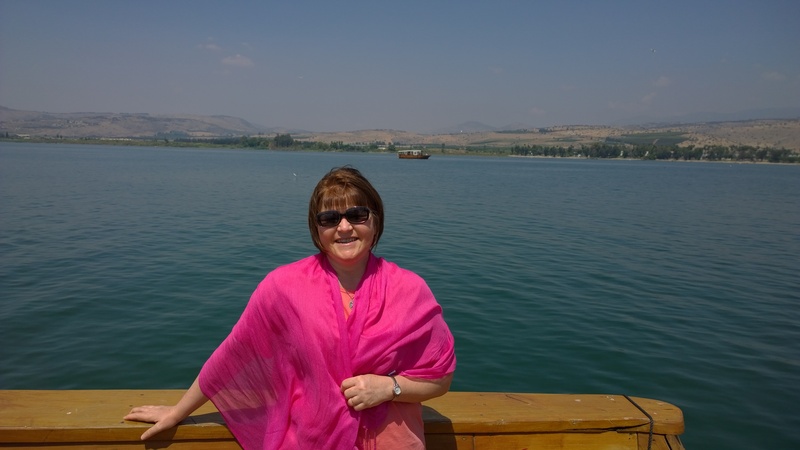 Granted, the Sea of Galilee is absolutely beautiful, but it’s more than that. Being out on the boat looking toward the shore, I was able to see the lay of the land and to do a sort of “connect the dots” with the various places that our Lord had ministered. Me, standing on the bow of the boat. The scarf isn’t vanity; it helps shield the skin from the sun. THAT was way cool! The Bible makes it all sound so matter-of-fact, almost easy. Now Jesus went here, now Jesus went there. The Bible tells us incredible things, but what it doesn’t tell us is how difficult those journeys were to make! It required anywhere from a few to several days to walk from one town to the next. Plus, many of the places to which Jesus traveled required some serious hill climbing! Now add to that the intense Israeli heat (hence, my nearly fried back of the neck) and you’ve got yourself quite the challenge! I don’t think I have ever perspired at the intensity and duration that I have been here. One of my colleagues was giving serious thought to getting himself one of those Bedouin robes. If he had, I think I would have joined him! Of course I could write more and more (and more), but for now this weary journalist has got to get herself off to bed. Tomorrow, we trek Jerusalem and in the evening we’ll attend a reception for foreign journalists with Pope Francis. Well, at least I can try to sleep!